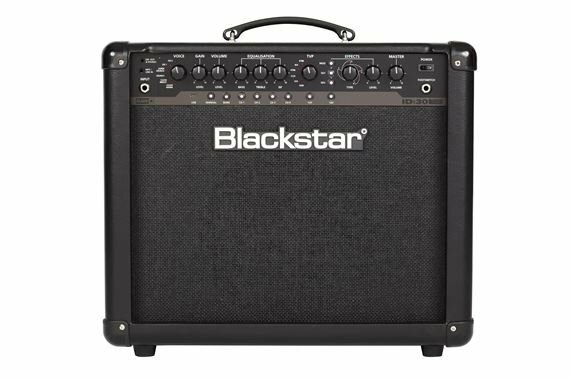 Shop Blackstar ID30TVP Guitar Combo Amplifier from AMS with 0% Interest Payment Plans and Free Shipping. 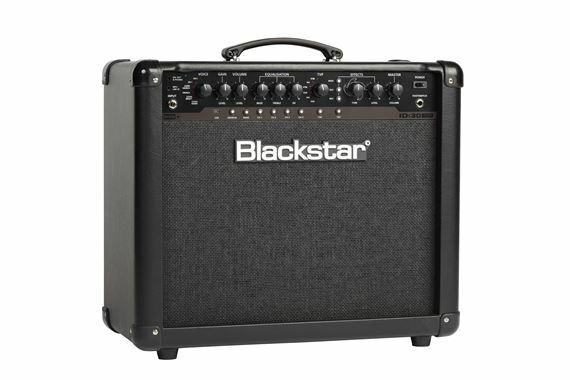 Guitarists looking for a simple solution to their home recording and practicing conundrums rave about the Blackstar ID30, which provides many of the unique features and functions that they have come to expect from the larger ID models, but is supplied in a compressed combo layout for easy portability and ease of use. The ID Series is the result of more than seven years of technical research and development by the group that also designed Series One, Artisan and HT Venue. With the ability to create and store their own sounds, guitarists will be able to perform live with the same sounds they have perfected during ours of practice. By using the unique voice control, patented ISF and patent-applied-for True Valve Power, these amplifiers allow unparalleled flexibility and ease of use, enabling you to design the sound in your head and deliver it live. LOUD as Valve. Individuality is power! I'm amazed by the versatility of this amp! The presets in demo mode are great. The possibilities are endless! We write music for major film and tv and are life-long stage performers. We got this amp to give us another sound pallet in the studio and also as a small portable live rig (current rig is large concert stage rig). This amp delivers a great selection of tones with the tube-color selection switch plus has great tone at low volume. You can go from Brian May to Chet Atkins to Clapton to Yngvie. We have creamy and heavy chunk amps in the studio but this one gave us a wide range of tones, it's clean, and can be used in a number of scenarios both studio and live. Portablility is everything in live shows today. A great buy. We write and record for major film plus produce several live acts. We extensively read the reviews before purchasing and now that we've had test-time, we are very pleased with this purchase. Flexible tonal shaping from Vox styles to Marshall, plus clean overdrive. Not a hissy amp. This will be used in recording where, like Carlos Santana and most guitar pros, it is better to run a smaller amp hotter for great tone saturation. This amp will cover multiple genres and playing styles and will save on studio footprint by not having 15 individual amps each with it's own signature tone. Great bang for the buck. I love this amp. Cleans are awesome. High gain is outstanding. Love the effects and tvp, can get any sound you can imagine. Given that I am one of the unfortunate souls to begin playing during the inception of solid state amps, it's amazing to see how far they've come. This is not your run of the mill "modeling" knock off amp. This is as close as you can get to valve volume and response without the real deal. Using it as a living room amp when my big boy is just too much for the neighbors. Blackstar has done an out job with this one. Well worth the small sale price! Best amp I've ever owned... Period!!! This amp is by far the most versatile and best sounding amp on the market... A must have!!! Excellent, well worth the price, sounds great! Far batter than I expected. I have been using Vox AC30 and Marshall amps my whole life and this amp completely blew me away. I'm not saying it is a replacement for my other amps, but it has found its place in my lineup. Give it a try and I think you will be impressed, for the money this amp can't be beat and is light years ahead of the Line 6 amps that competes against it. I originally bought my nephew one for his birthday, but after hearing and using it I got one for myself. It's a great product and I highly recommend it. I'll be looking into Blackstar much more seriously after using this. BTW this amp (30) is very loud. This littlle amp. is just fantastic !! I can't believe this amp. sounds so good very close to a tube amp.